Top o’ the morning to you and Happy St. Patrick’s Day! For the past couple of years I have spent St. Patrick’s Day on some tropical island or sunny beach – today I spend it at my office. Boo. Today is special to me not only because it’s SEVEN MONTHS TIL OUR WEDDING, but also because as a child I spent many St. Patrick’s Days watching my cousins play the bagpipes, eating corned beef and cabbage at my Great Aunt C’s house, and Irish step dancing around as the fife players and fiddlers marched through my town. 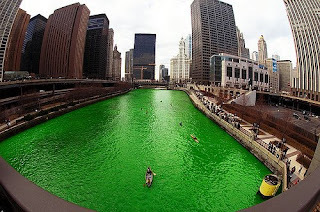 Someday I will make it to Chicago to see their river dyed green… how awesome is this…. Check out the article about green beer, Irish food, and all sorts of St. Patty’s Day sources of exercise here! haha, my Mass-hole bff has one of those rings! He and his wife are both red-headed New Englanders, so I’m pretty sure they will be partying like crazy tonight! PS – I’m in Atlanta too! We’re going to the Highlands St. Pat’s fest! HAPPY 7 MONTH TIL YOUR WEDDING DAY!!!! Hi Caitlin – I am your PJ swap partner…FUN!!!!! Congrats on the impending nuptials… Very exciting – email me your deets (size, favs, etc..) or leave me a comment on my blog. Thank you so much for my award and finding me kreativ!! I love it!! Hello lovey, measurements for the Lilly dress 31 inches from top to botton, 14 from armpit to armpit. Awww, thanks for the love! 🙂 Have fun today!! !